I know, I know... that wasn't a very clever title but I just couldn't resist! It's Melinda with you today and yes, it's time to drag out that washi tape again. I'm determined to make sure you put your rolls of tape to good use instead of having them collect dust from being overlooked. 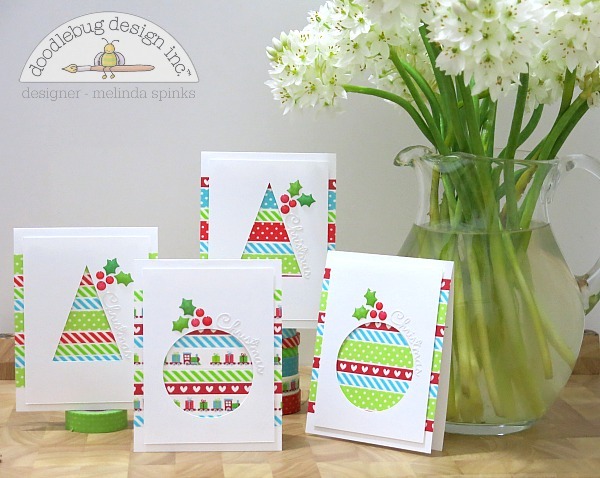 And what better way than to create fun Christmas cards that require very little planning and not a great deal of time. Perfect! 1. First things first... cut/score/fold all your cards using white cardstock and measuring 4" x 5". 2. 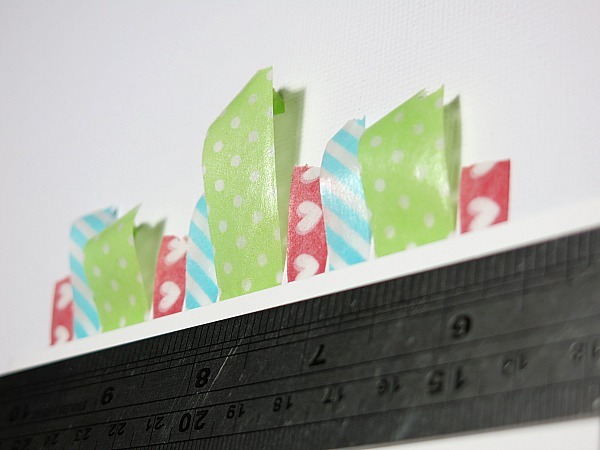 Layer your strips of washi tape to the front of each cards. I left a 3/4" margin at the top and bottom. 3. Turn the cards over and cut off your excess tape using a new blade on your craft knife. 4. Using more white card stock, cut a front panel for each of your cards measuring 3.5" x 4.5". 5. Cut your Christmas shape from each panel. 6. 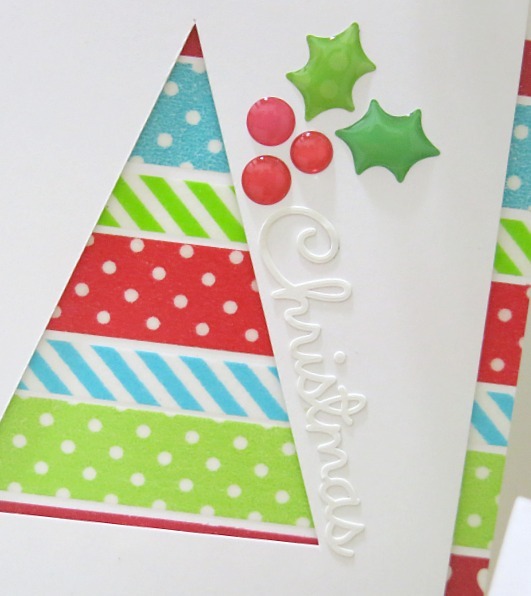 Decorate the front of each panel and then using foam pop dots adhere to the front of your cards. You can create any shape you like but remember to keep it quite simple as the washi tape needs to be the main feature and you don't want to spend hours cutting out intricate details. Christmas cards need to be fun, simple and easy to make otherwise it's probably more cost effective with your time and money to use store bought cards... and where's the fun in that? WONDERFUL Washi Tape cards Melinda!!! What a FABULOUS technique and GORGEOUS designs, LOVE your Washi-filled windows and white-on-white sentiments!!! These are just fabulous Melinda! Beautiful collection of cards! What a great use of washi! I am soo inspired!! Thank you so much for this post. I love these cards! I may just have to give this a try for my Christmas cards this year! What a clever idea and simple way to make lots of holiday cards. Love them! I clipped this idea - what a great one! Dang, Melinda. I'm CASEing this for all of my Christmas cards. Easy, colorful, and fantastic! Super cute cards! I love the way the washi tape was used, thanks for the inspiration! These are incredible!! Love the idea and the ease of making these!! 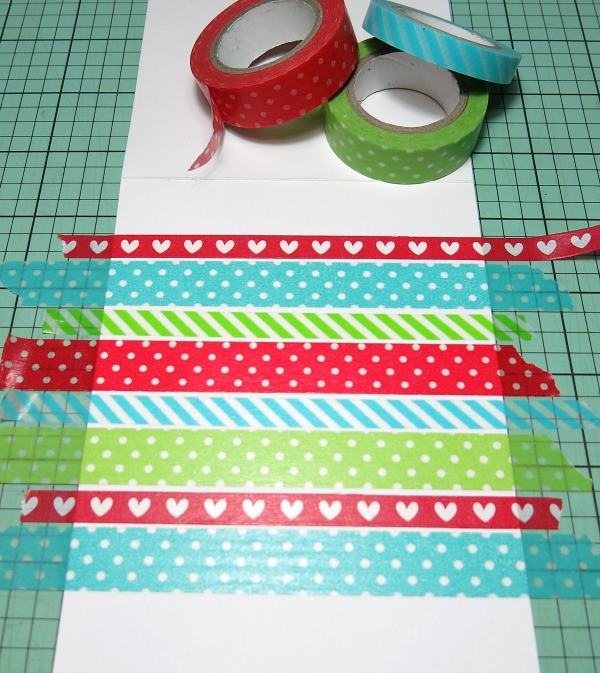 What fun it will be - I love playing with washi tape - especially Doodlebug's tapes!!! These cards are so cute and awesome! I love the idea and plan to use it for some of my cards this year! AWESOME tutoririal, and use of Washi! I love it all! These are super cute! What a great idea! I love it! OMG Girl YIIKES talk about being super duper clever and creative WOWIE WOOZERS!!! You totally knocked my creative socks off.....You and your brilliant and genius Washi Tape ideas YOU so ROCK! !